Apple Cider Chicken with Pears & Apples - Kosher In The Kitch! 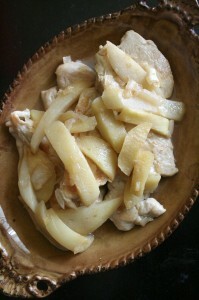 Apple Cider Chicken with Pears & Apples - Kosher In The Kitch! Apples and pears cook together to make this wholesome and nurturing dish that is full of flavor. Saute onions in 1 tablespoon olive oil until translucent. Add chicken pieces and cook until no longer pink. Remove from heat and set aside, wrapping in foil to keep warm. Add remaining olive oil to pan, and cook the pear and apple slices until tender. Combine the apple cider with the apple cider vinegar and add to the pan and bring to a boil. Lower heat and add the chicken back to the pan. Cook for an additional 5 minutes then serve with apple and pear slices.